Just a quick note to let you know I"m enjoying my visit with my mom and sister and her kids. Mom is still having a problem dealing with the blood sugar tests and not being able to see, but we went out and bought a new kind of monitor today and she did much better tonight. My birthday is tomorrow so my nephew's and niece planned a birthday dinner for me. 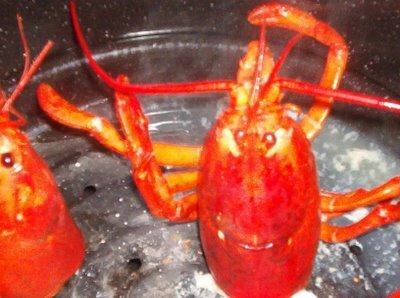 James (my godson) knew I loved lobster so went to the store to pick them out for me and then made this lovely arrangement for me with the heads! (He is in 5th grade). My niece Rebecca made me an ice cream cake with funky party ice cream and bright blue frosting (she is 9). 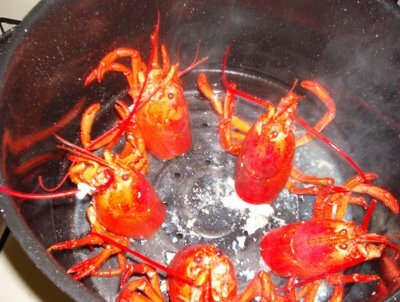 It was quite a dinner. I"ll be back home later this week. Yes I"m ready for some sun and spring! I"m not really a spring fan - I love fall much better, but I"m just feeling a need for some sun, so bring on the spring! (Well ok, only if it is sunny and not rainy!) So to get me in the mood I've changed my "look" once again - just for a short time. Here is a new Block of the Month my mom bought me for a Christmas present this year. This is block 1. 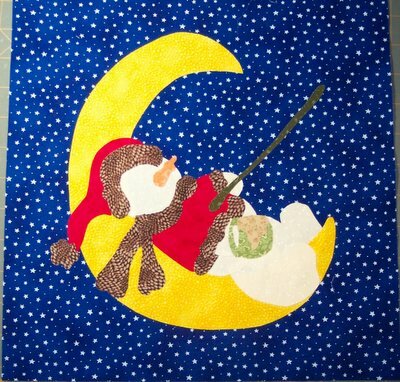 The name of the quilt is Hot Chocolate and it will all be snowmen blocks. 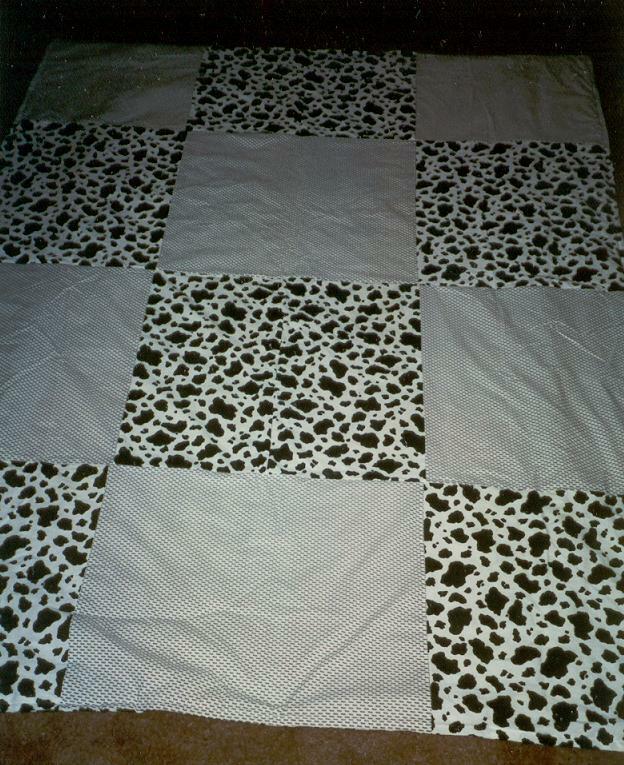 I need to do the stitching yet on the block, but at least I got it this far. A few of you have written to ask if I"m ok. I am. My mom went to the hospital last week and just got out today so I'm going to be leaving Friday to fly out and see her. So I"ll be away for another week. I'm not sure if I"ll find time to blog or not. And if I do I doubt I'll have anything to blog about anyway! In case your wondering she is doing ok, but will never be quite "better". She is starting to see the effects of diabetes and is slowly loosing her eye sight and last week her kidney's were only working at 10%. So while she was in good spirits today when I talked to her, she is thinking she would like me to come visit. My sister lives next door so I'll get to see her and her kids too! So don't fret when you don't hear from me - I"ll be back! The 2 that got away! Well here are the 2 blocks that got away! I put them with leftovers of some of the fabrics on the back! Not the best picture but it is late at night and I'm in the basement - but you get the idea! 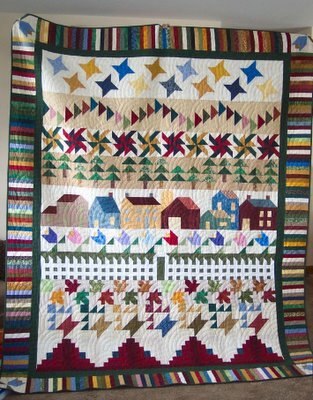 I"ve had so many questions about this quilt I'll try and answer them, but forgive me if I forget some. My mind is on other things these days. Some of you know and others don't but I'm having teenage son problems and it sounds like it is the normal for a lot of boys - but boy is it hard on mom right now! But thanks for all the kinds words and stories - sounds like there is hope, even if it might take 10 years to get there. And another thing I haven't mentioned is my mom went in the hospital last week for kidney failure. So I've been holding tight waiting to see what is up. She is out east with my sister, so my sister has been keeping me updated. It is a long story why, but basically my sister thinks she is lonely and just isn't working too hard to live. Darci (my sister) finally got her to agree to the dialysis and she was doing a bit better. She has convinced my mom she needs to be around to see her first child graduate from 8th grade and get confirmed this spring. So whatever it takes. Mom kept telling Darci not to let me come out while she was in the hospital so I haven't left yet. But I guess she finally broke down today and asked if I could come out when she gets home to take care of her for awhile. So even talking about coming home is a good sign! Anyway, in case I dissapear suddenly - don't worry - you know where I went. Well talk about getting off track. Back to the liberated log cabins. 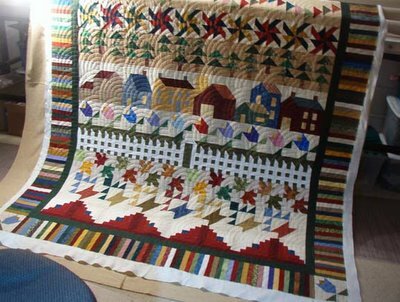 The quilt top is approx 40" x 46". 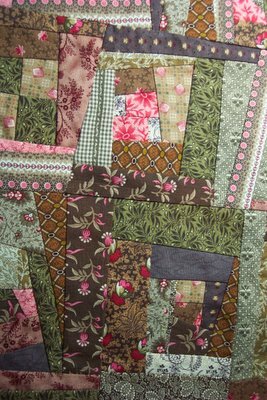 A bit will be trimmed off the borders once I'm done with it, I wanted a little extra on for quilting this one. Lucy wanted to see some of the fabrics closer up, so I tried to take some closeup pictures, they are ok, once again basement light! 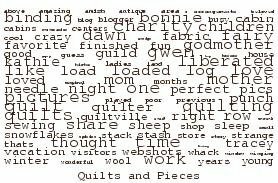 Lilly asked how I determine when I hand vs machine quilt! Well - it mostly depends on my mood! 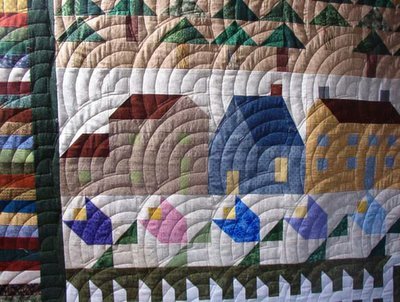 But I don't have much time with working full time and a long commute, and 4 teenagers - so I only hand quilt special things and/or things I think I can finish by hand! 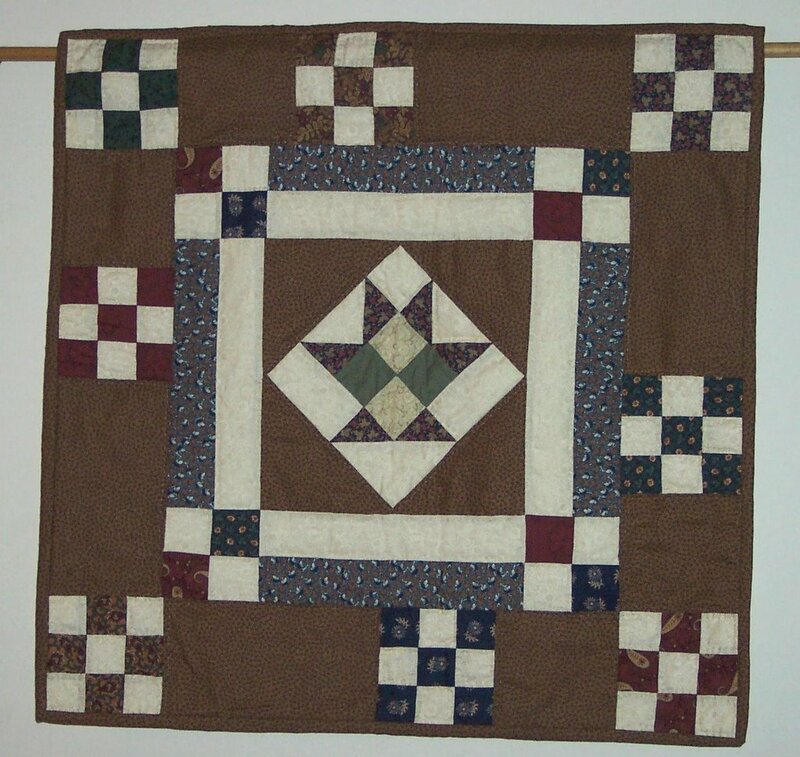 I also don't have a long arm, so how I quilt things also depends on size and complexity. So some stuff I do send out to longarmers. 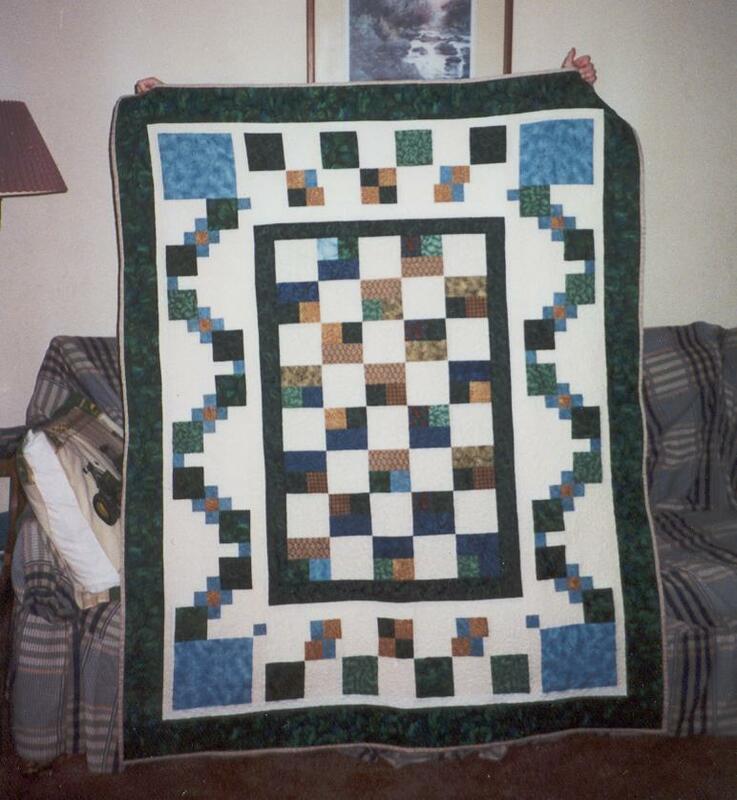 I love how this quilt turned out, but with all the seams there was no way I would ever be able to hand quilt it (plus I'm working on a big one right now). So I"m going to machine quilt this one myself - it isn't that big. I've teased Darcie (not my sister Darci) that I'm keeping what I'm doing a secret so I can't tell you quite yet. I just hope it works out! OK, does that cover most of the questions? Not sure but it is about all my mind can handle for right now! Toodles everyone! 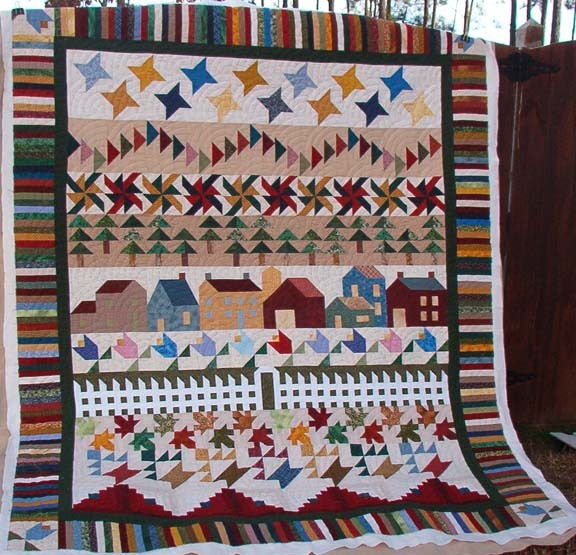 Yes - my liberated log cabins top is done! 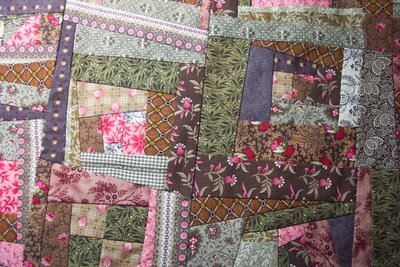 I"m piecing the back of the quilt now and have planned how I"m going to quilt it! It is going to utilize the wide border I put on - but that is all I'll say for now! 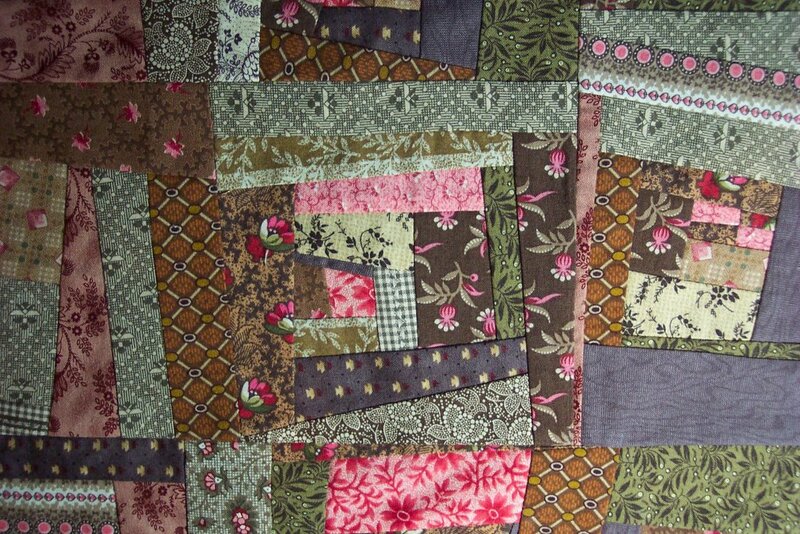 I"m going to machine quilt this one. 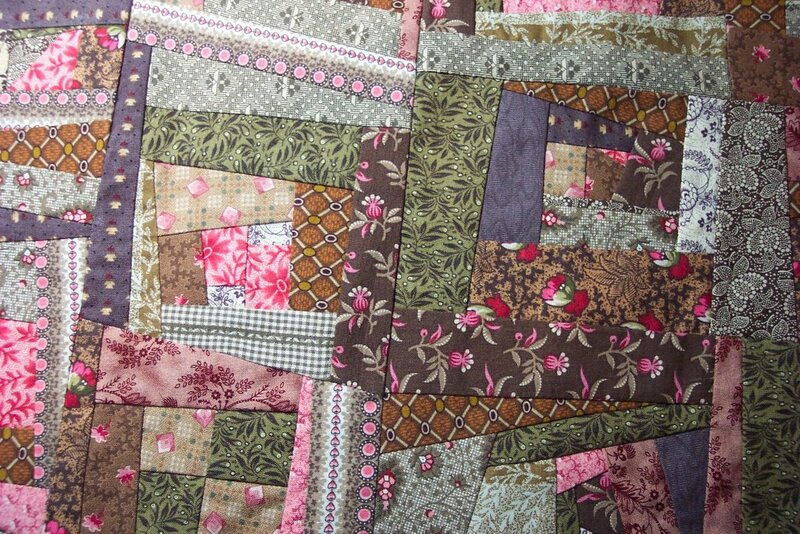 I"m hand quilting a large quilt right now and for what I want to do with this machine quilting will be much better. Won't chat much today. Like a few others of you, I"m having teenage boy problems and not quite in the mood. Why are boys so hard? Growing up he was so much easier than the girls. But boy he hit 17 and that all changed. Biggest problem now is that he turned 18 and knows we can't do much about him doing as he wants unless we pack him up and kick him out. In my heart I just can't do that yet. So for now - enjoy the log cabins! 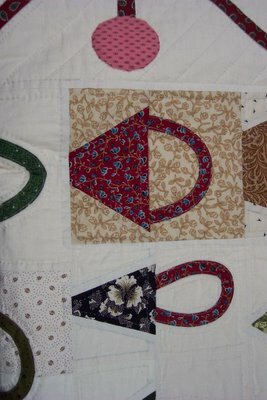 Kathie and I were chatting today about scraps - what's new huh! 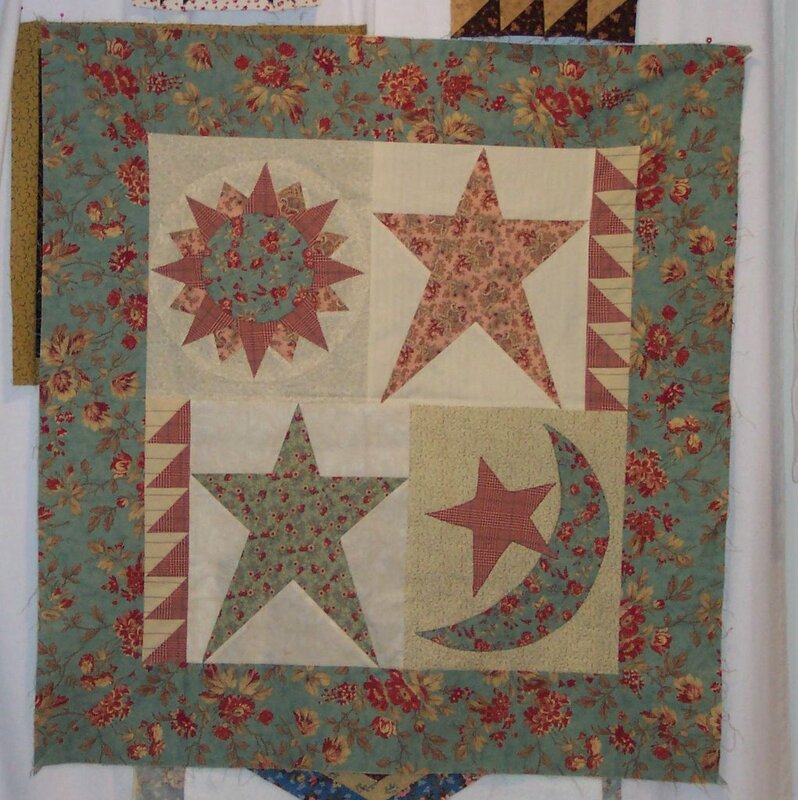 :) Anyway, she is using her leftover squares from her liberated star quilt to make those 25-patches. This made me remember about 3 years ago when I made doll quilts to go with some cute primitive dolls I bought at a craft type store. 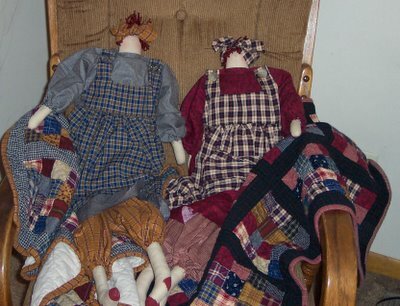 I requested 4 dolls to be made in plaid/primitive colors and asked if I could have some scraps to make quilts to go with them. The lady was agreeable and I made 4 16-patch doll quilts to go with the dolls for Christmas presents. And can you believe it - I can find pictures of only 2 of them. Oh well. Anyway, Thanks Kathie for the memory! WOW - I had better get busy! WOW! 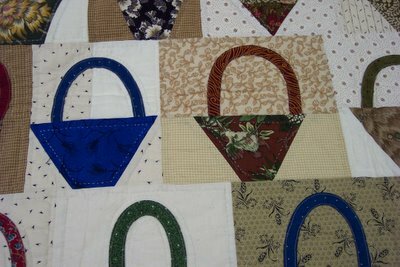 I had better get busy making birthday wall hangings! And I found out I do have friends who have birthdays that are not in May!!!! Bonnie I got it bound! I got my row by row quilt binding on!!!! Just have to hand sew it down now! 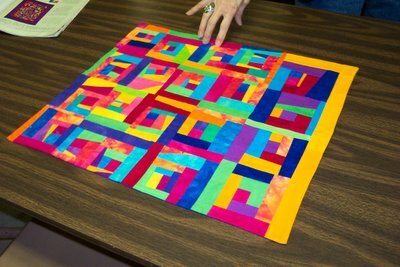 It is beginning to be a REAL Quilt! No, I"m not suggesting I"m an angel, but feel free to call me one if you want to! I"m quilting a very primitive/folk art quilt and am at a loss for what to quilt in/on the angels head. I don't want cutsey since this is primitve. But the head is too big to leave unquilted, but not so big that it has to have a lot. So any suggestions for an Angel.... head. Oh by the way, I'll be unveiling blocks as I complete/work on them. I don't want to give the whole thing away right now - I"ll be working on this for a long, long time so I need something to keep me motivated! Here is another project I worked on this weekend. 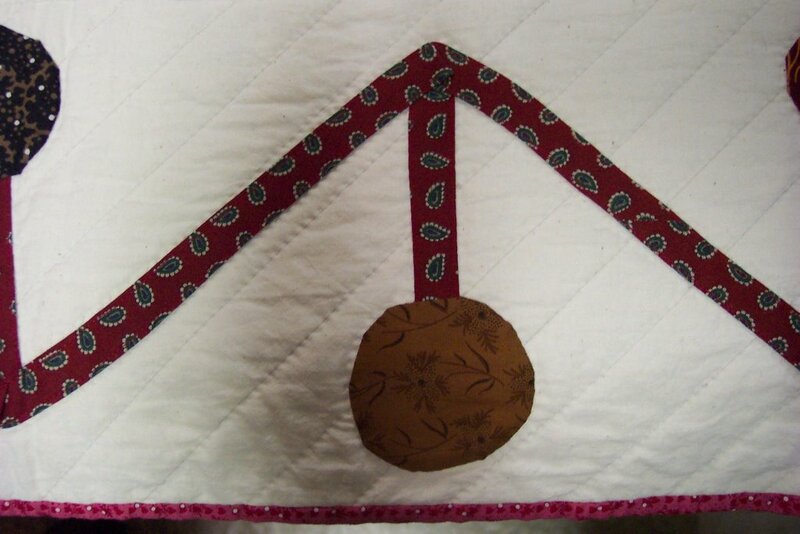 It is a small wall hanging for a quilting club I teach at the local quilt shop. 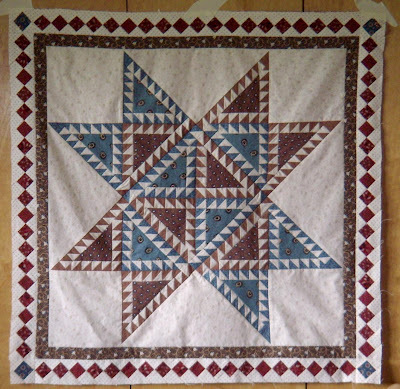 The original pattern had only the stars and moon. So I added the little sun - you've seen that block before on one of my posts! 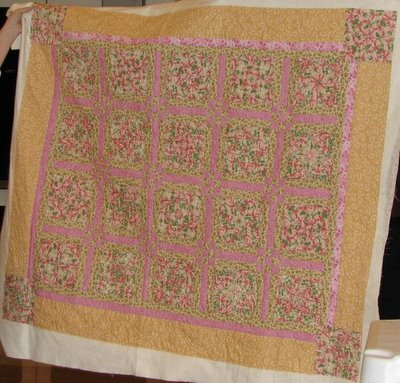 This little quilt is going to go to a friend of mine who has a birthday in May - if I get it quilted in time! :) But can't say her name because she may be reading this! I'm safe - every quilting friend I have has a birthday in May! Why is that? 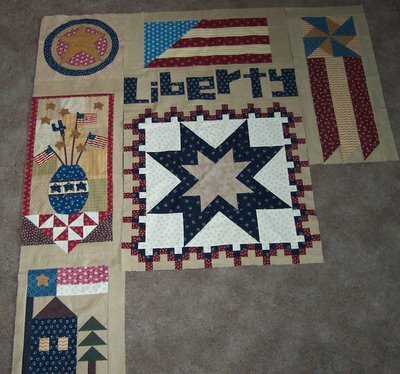 So this is my liberty quilt so far! It has been a long time in coming this far. 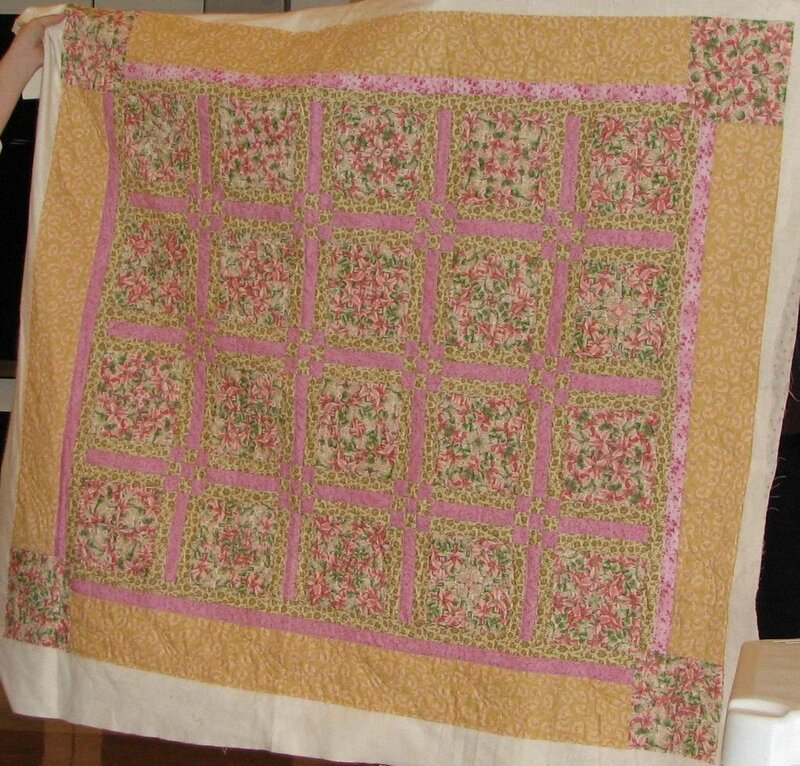 I started this quilt last spring with my good friend (and quilt buddy as my family calls her) Lynn. We often don't have time to quilt together because work and families make it hard, but we thought we would at least work on the blocks at the same time. By summer we had the big center star and the left side strip done. Lynn then had some outside obligations so we had to put the quilt on hold. So I packed it up and set it aside. I wasn't going to work on it without her. Well just recently we were able to start it up again. So the next step was to make the big flag on top and the pinwheel banner on the right. Got those done on Saturday so Sunday I got to work on the words Liberty! 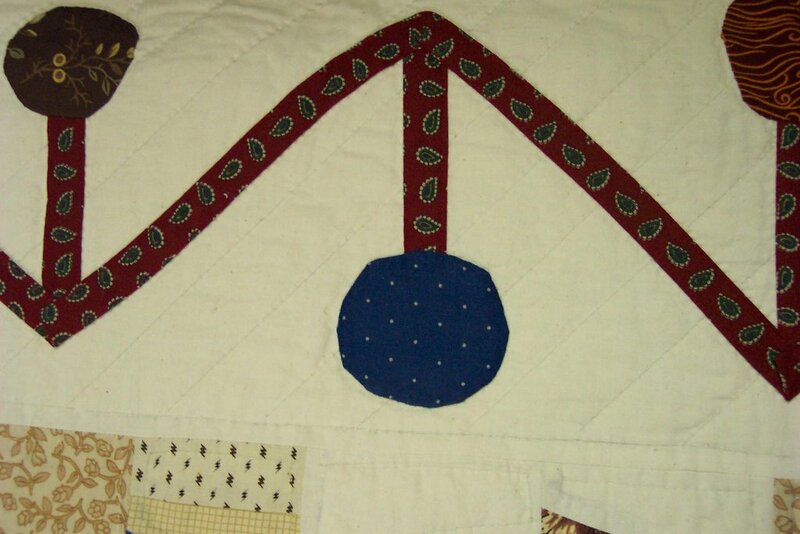 In that spot is suppose to be a gold viney thing with stars or flags - embroidered. 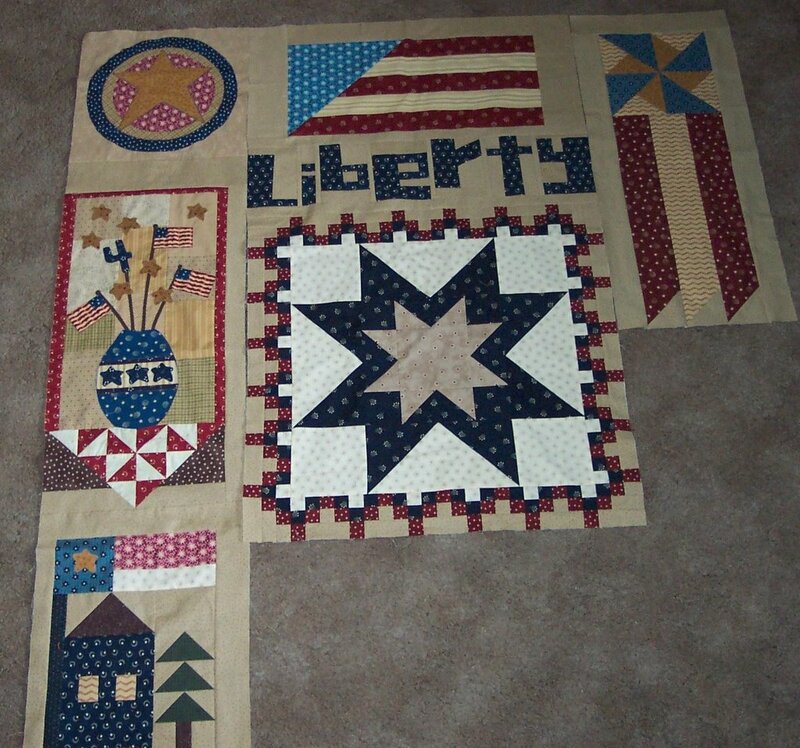 I wanted something not so stitchery and more maverick and had thought to put Tonya's letters there with the word Liberty! Isn't it perfect! 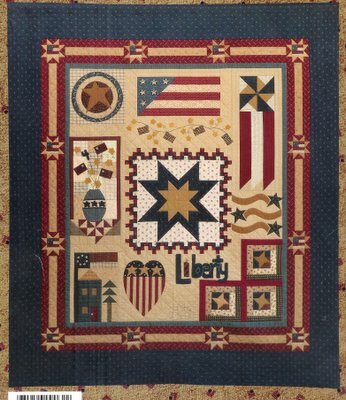 The quilt has the word liberty below the large star, but it is appliqued on and all smooshed in - so this fits much better here! Besides - Lynn and I don't want them to be exactly identical! 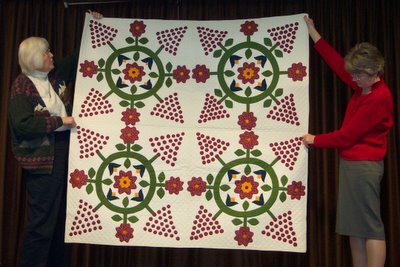 We will probably have them in our next guild quilt show, it is nice to have them slightly different. We decided to use the same fabric line for it although we have used different accents and placement of the fabrics. Just so you can see what the pattern one looks like I've posted that as well. I finally got to play today! And I finally found time to try more of Tonya's letters! I created the word Liberty! 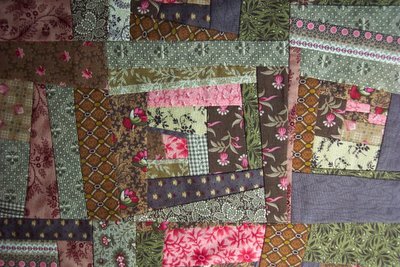 Tommorow I'll show you a bit more of the quilt I"m working on. But for today - LIBERTY! Oh the biggest challenge with these was I had to make it fit in a specific spot and I had never done lower case letters. It was easier when I could follow Tonya's tutorial for the letter. Thank goodness Tonya had drawn out what lower case letters for Liberty would look like so I could kind of mimic her drawing! Thank You Tonya! I could never have done it without you! I was reading Finn's blog late last night and it got me remembering things from my past. 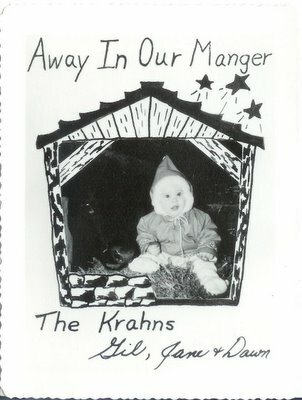 And for some reason I started thinking about all the old Christmas cards my dad used to make when I was very young. He used to take the picture and then make the "card" on photo paper. I remember them developing or something in our bathtub! Every year there was a theme. My favorite one was from my first Christmas. Now of course I don't remember that Christmas, but I do have the card and remember the stories around it. At the time we lived in a very rural IL farm town. My dad taught at the area HS and my mom was a substitute teacher. On days when she had to fill in, the people who they rented their farm house from would watch me (their farm-house was on the same farm but not exactly next door). Anyway "Grandma and Grandpa Baker" actually had a farm and when they would have to go out to the barn to do chores they would plunk me in the manger by the cows to keep me out from underfoot! I hear I was good friends with those cows! So that year for the Christmas card it featured me in the manger and my buddy cow! 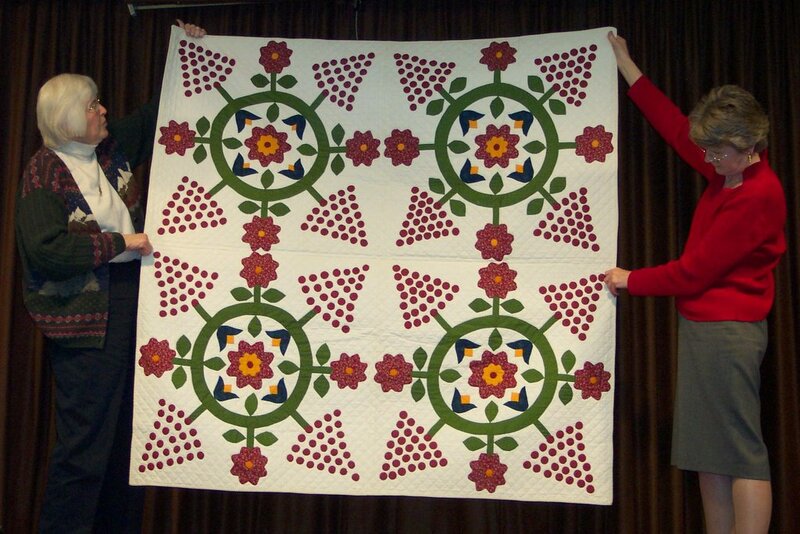 I did get to quilt a bit last night! So that made me happy! 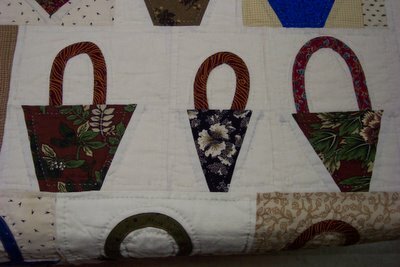 I'm working on a wall hanging that has to be done by Monday night - so I'll have some pictures this weekend for you! 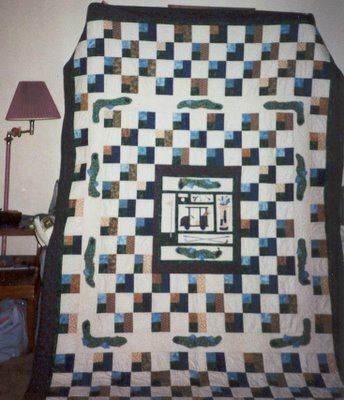 In the meantime I've dug up an old, old, picture of a quilt I made. 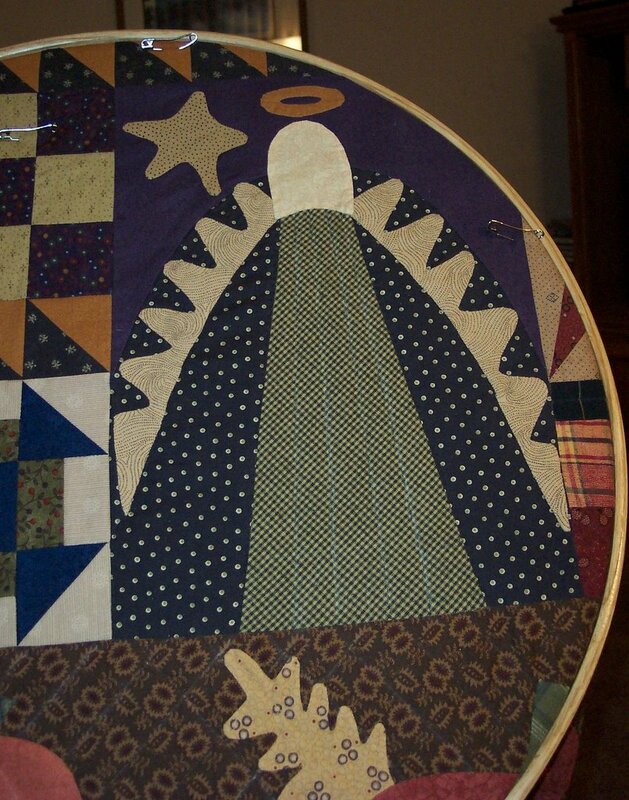 I made this quilt about 10 years ago for my nephew (and godson). 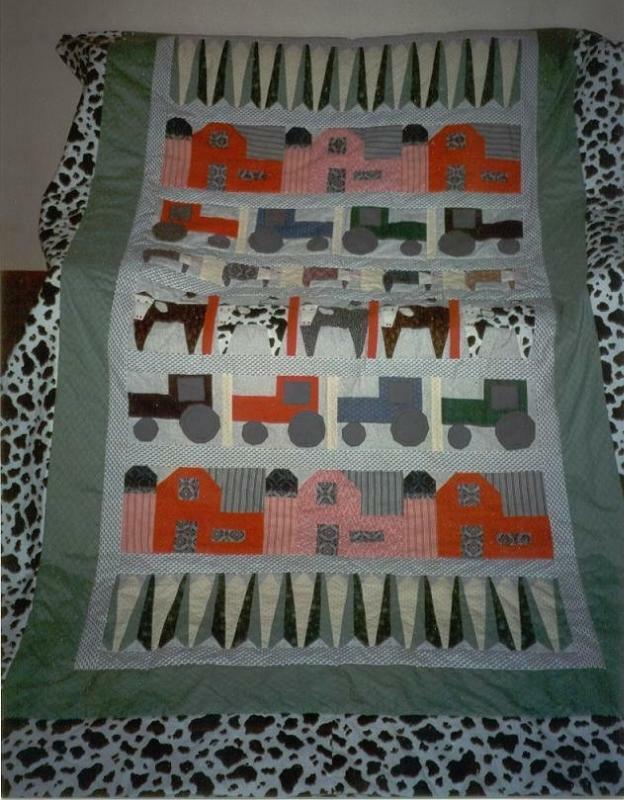 I got the pattern from an old Prairie Farmer magazine! He loved the quilt to death. 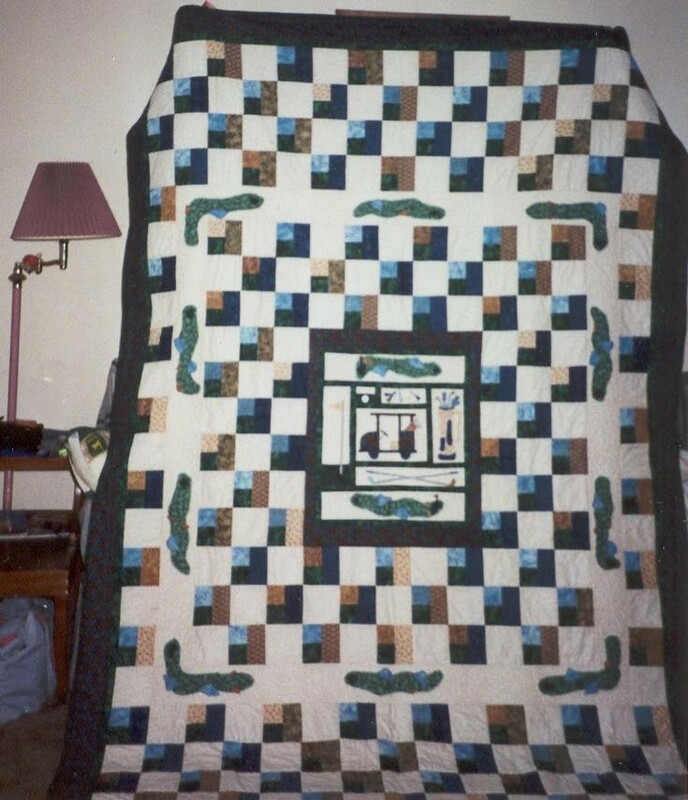 So when quilt #2 was made for his bed about 5 years ago, he loved golf. So I made him this gold quilt! I designed it myself! 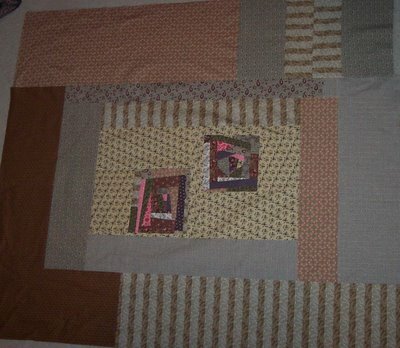 I even used all the scraps to make a small lap quilt to go with it! Not sure what I'll do for his next one - I'm guessing that will come soon - unless he decides he is too old and cool for quilts while he is in those teen years! My family drives me crazy! Yes, this was my family's idea of a joke! 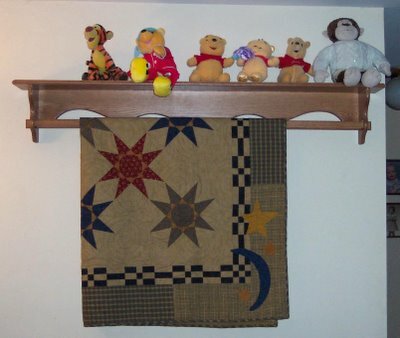 I bought this quilt rod/shelf with some money my mom gave me. It finally came in (I had to order it) and bugged my husband to hang it up. I come home Monday night to find it on the wall but "visitors" sitting on it! And just to remind you - my kids are all teenagers - they aren't even youngsters! But the favorite stuffed animals still are out and visiting all the time! As you can see Pooh is the favorite! And speaking of Pooh - when I read Evelyn's post about the blankie wash for little boy it made me remember the times we had to wash Pooh Bear. Oh it was so traumatic. Adam would cry and cling to poor Pooh. Until finally we thought up the idea that Pooh wasn't being washed - he was going on a water ride like at the amusement park - well then that made it all fun! Thank goodness! And just to put a quilt in here today since I'm in a dry spell for having time to quilt, this is one of my most favorite little quilts I hang up. 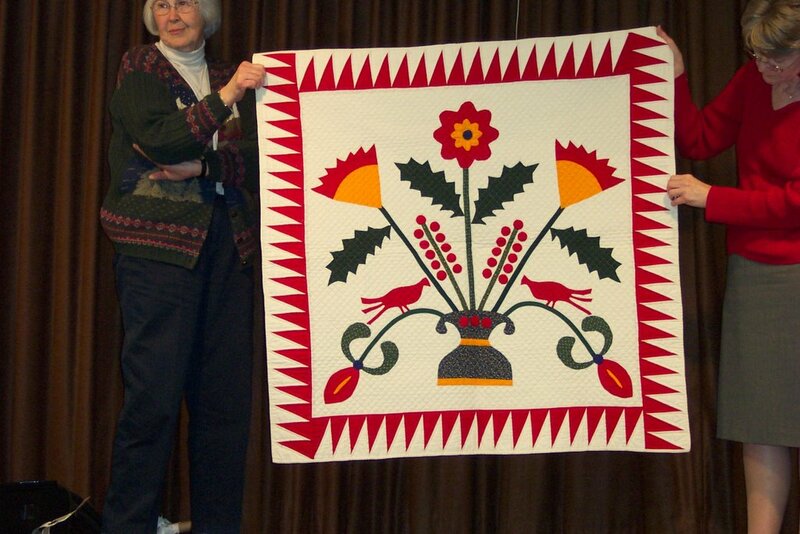 It was made by my quilt buddy Lynn for a silent auction at our quilt show about 3 years ago. I wanted it so bad. 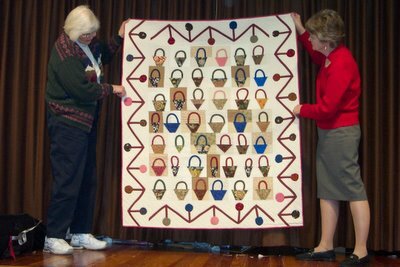 She kept saying it wasn't anything special and she hand quilted it fast and little. But I wanted it! Needless to say I watched the bid sheet and won it! There is something about it that just draws me in! So since Patti and Kathie are on little quilt kicks right now I thought I would share my favorite one! But I have to say I really want that poison green star quilt Kathie showed - and then to find out Patti had one Jo Morton made of it - oh to die for! Hmmm, my blog cloud came out with "crazy Dawn" jumping out at me! 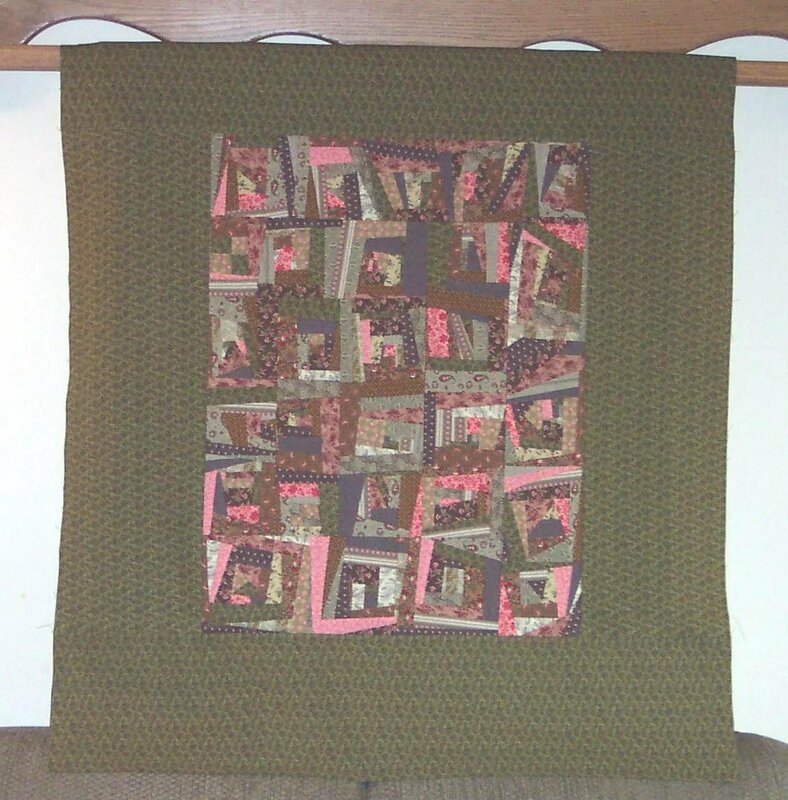 You all have been seeing all the charity quilts I've been making from my stash. Feb was Charity Month for our guild so I was trying to get them done for that. I have one last charity quilt I didn't show you because I never got the binding on! But I got it pieced and quilted, so I took it to guild along with the binding fabric and another lady volunteered to do the binding! We have several ladies who like to do the bindings at charity night so that worked out great. So above is my last charity quilt for this round - minus the binding! 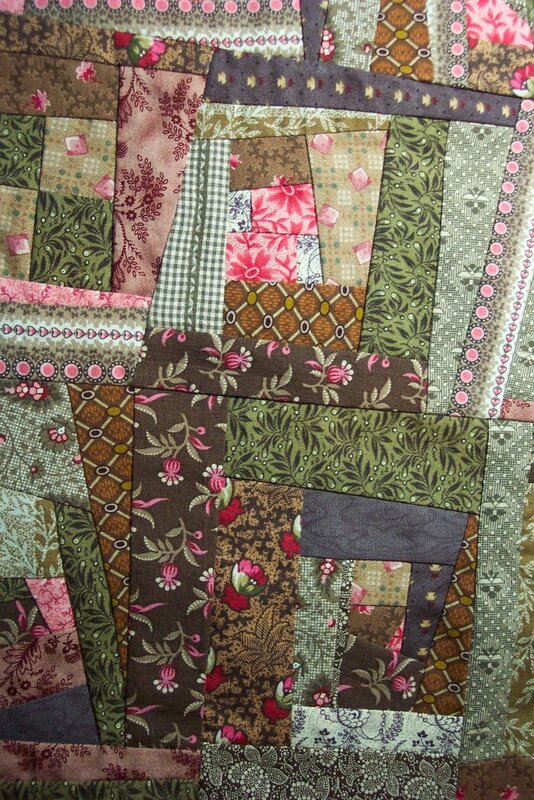 It was a floral fabric I had in my stash that I made stack n whack 4-patches out of! It turned out cute! 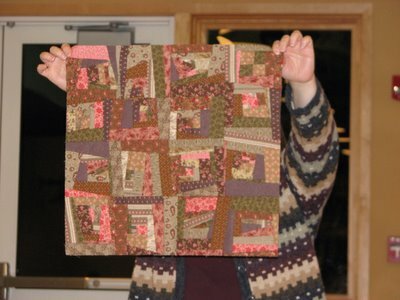 It wasn't the perfect fabric for stack n whack - but for charity it worked out good enough! I"ll be doing more charity quilts throughout the year, but for a month or so I'm going to take a break! Especially since I'm still running in circles at work and have had NO time for quilting the last 2 weeks - I'm totally depressed about that! Especially when I see all the fun things Kathie is making! I want her sewing room, stash and time!!!!! I'm sooo jealous! But you know, there are times when I get sewing up a storm and she can't so it almost evens out, I'm just bummed right now because I'm in the no time for quilting spot! 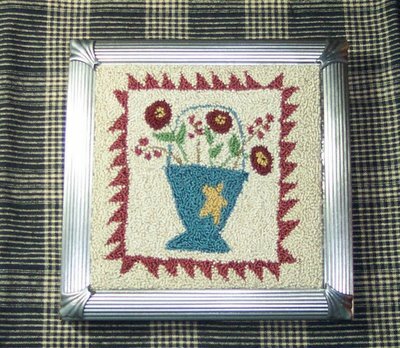 2 more Punch Needle Pictures Done! 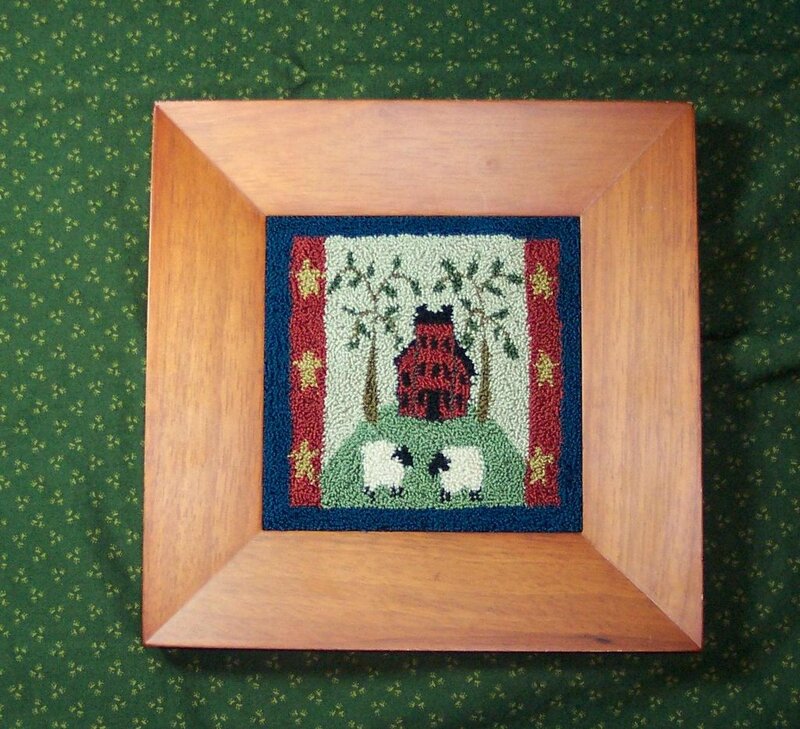 I finished 2 more punch needle pictures! Actually one of them was done over a month ago, but it was for my very special and sweet friend in Australia who reads my blog, so I didn't want her to see it! She now has it in her hands and I can share it. 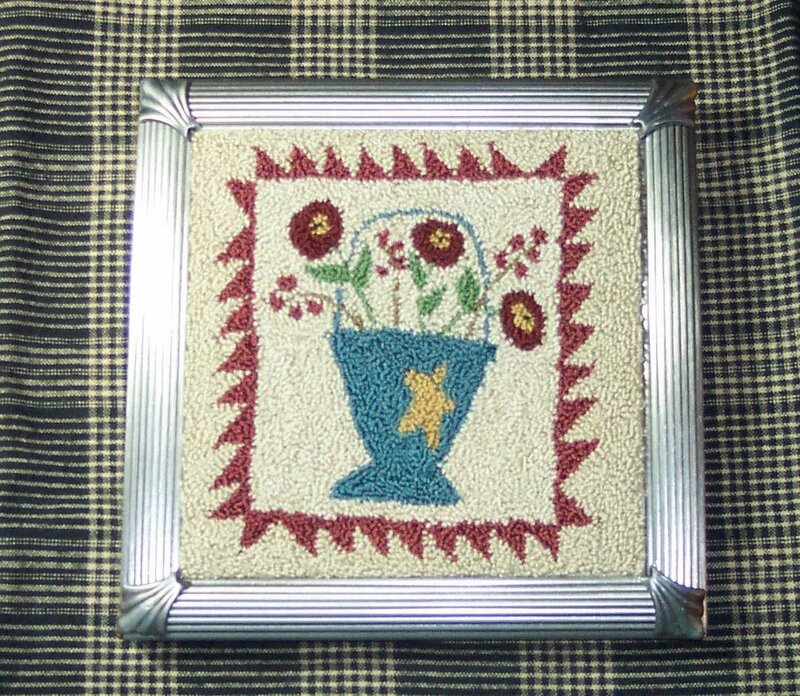 It is the one above of the pot of flowers with the quilt triangles around it. Isn't it great! 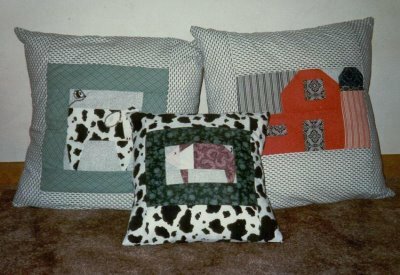 The one with the sheep is for the local quilt shop for display for a class I'm going to teach on it! I think it is so adorable with the sheep. I used wool for the sheep and love the texture and look, I wish I would have made the wool punches a bit longer! But I can always do another one! But not for awhile! I need to get back to quilting! Geez, I finally found some time last night to browse the ring and can you believe it - just as I started going around they turned blogger off for maintenance! Arghhhh! So I"m off to try and catch up a bit more before too many people get into work! Finally - all Gwen's pictures loaded! OK, I finally got all of my pictures from Gwen's Lecture and class loaded! Sorry it took so long, but work was so crazy and I kind of crashed and burned this weekend! Anyway, I loaded them all on my webshots area - that way if there are any anyone wants prints of you can just order them from that site. I figured that was a good way to share! Just a short hi for tonight. I"ll hopefully be sewing some more this week and have some things to share! 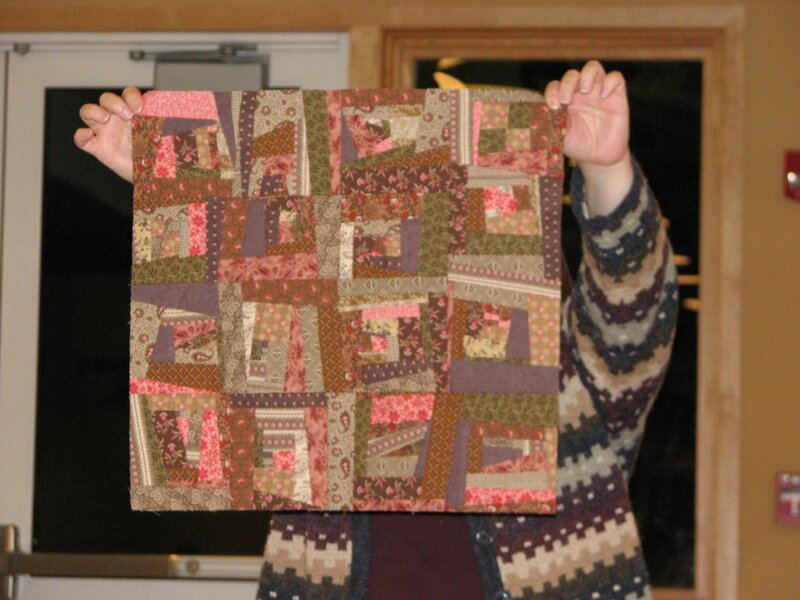 Oh one more quilt to share from the class. 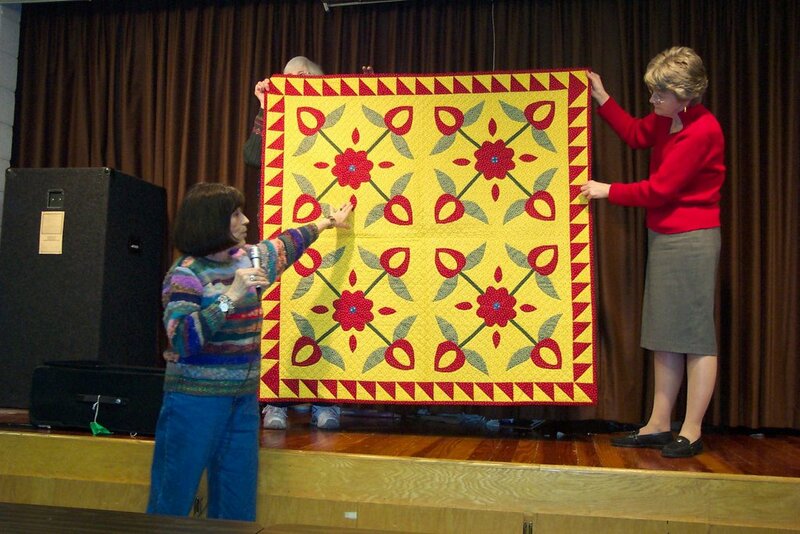 Gwen has lectured at this quilt guild 3 times now. The first time she became close friends with one of the ladies. 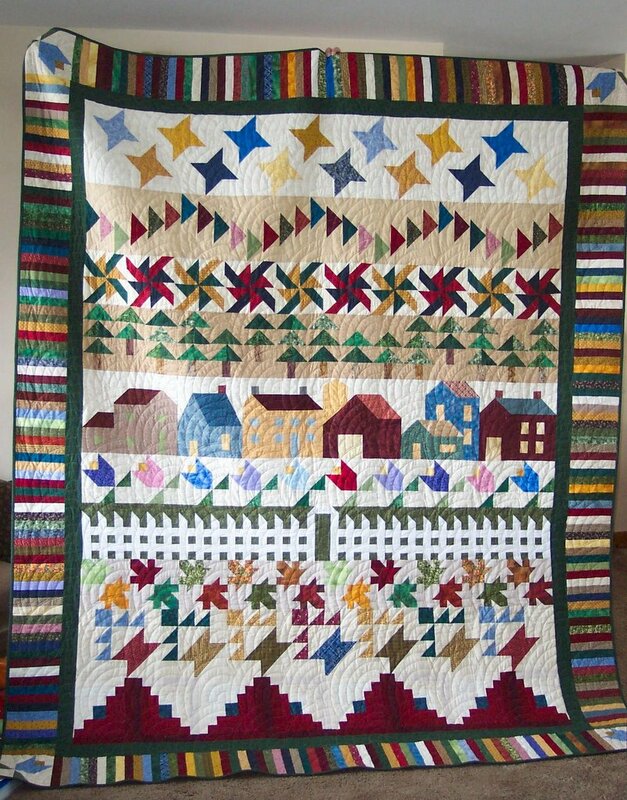 Not long ago I guess she died and the below is a quilt top she had finished before she died and someone had finished quilting it for the family. 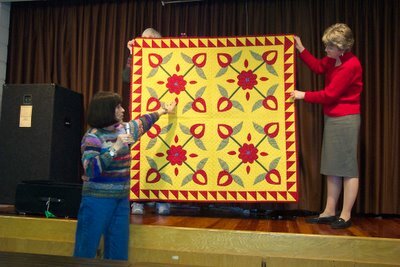 They brought the quilt in to class to show Gwen - isn't it great! 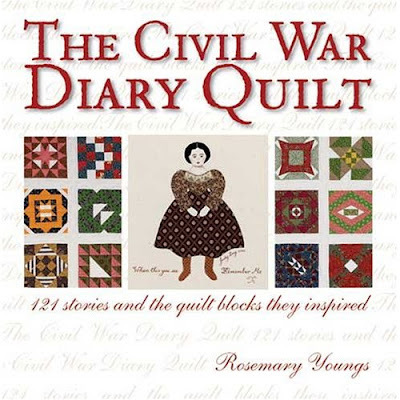 I see Tracey just got the 4 block quilts book by Gwen! (Yes I'm finally catching up!) 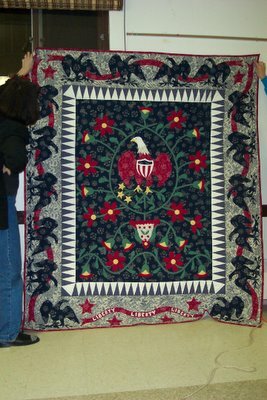 So I thought I would post some pics of the applique quilts I got to see last week during Gwen's talk. My favorite is the 4 eagles. I have no idea why, but I just love the way it looks and I've always wanted to do an eagle quilt. But look at these others! They are nothing to sneeze at either! I loved seeing all of them so much! So I'm sitting her at work on a Friday night at 7pm all alone. Decided I would take a few minutes to show you something really cool. I get an email from the International Quilt Study Center in Lincoln Nebraska each month with a "Quilt of the Month". 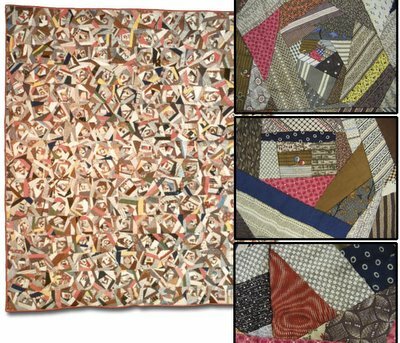 These are antique quilts in their collection and I love them! 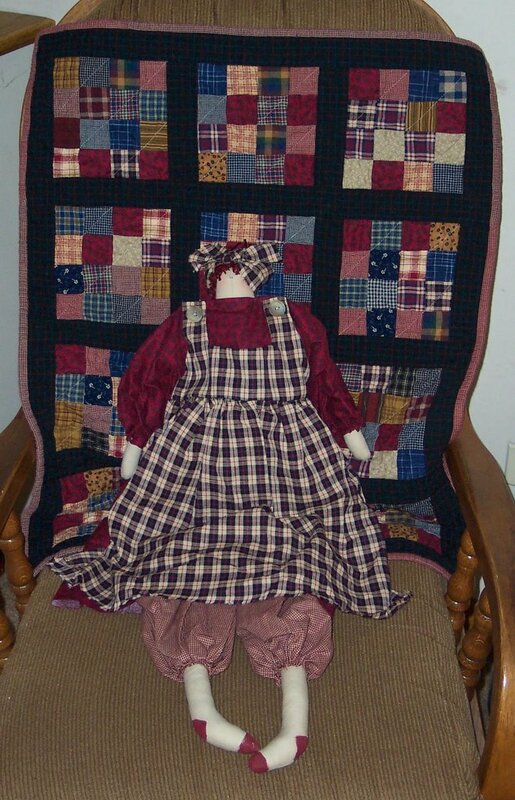 And the website is a wonder of beautiful antique quilts. Guess what this months quilt was! 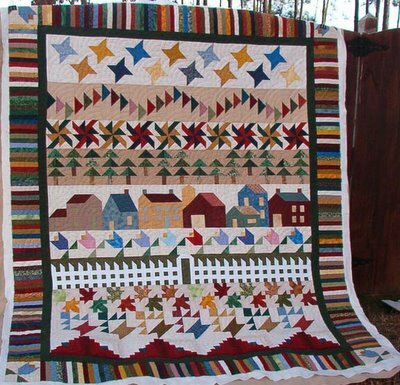 Basically it was a liberated log cabin quilt! 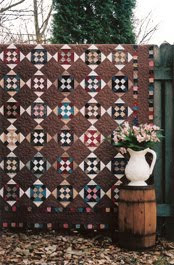 It is called Cotton Crazy and from far away looks like a crazy quilt but up close it is really liberated log cabins (circa 1890-1910)! Now how cool is that since I just took Gwen's class! 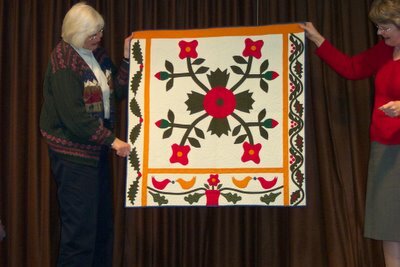 Isn't it a great quilt! 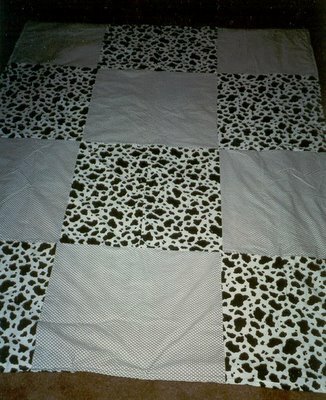 And look - just like my fabrics - ok almost (up to 16 blocks now)! I also wanted to share with you Gwen's liberated baskets quilt that Kathie is working on! I was so excited to see it up close and personal! So Kathie - these are for you! 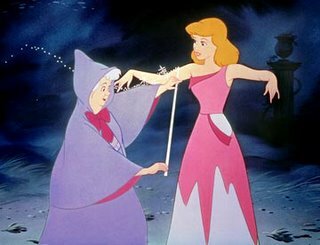 Once Upon a Time, Long, Long Ago..... there was a mom who had 4 young children, worked full time and did not get much sleep. This mom took a vacation one spring to visit her mother and sister in that strange land called Delaware. While on vacation with her 4 children (yeah right - vacation?) she took some time to go to the area quilt store. 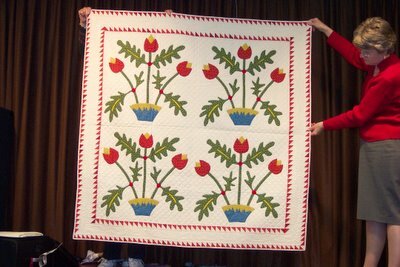 While there she saw a really fun row by row quilt hanging in the shop. It turned out this quilt was a Row of the Month club (remember this was a long time ago - like maybe 5 or 6 years ago) and her mother decided to treat her with this membership! So every month the store was kind enough to mail her that months row. 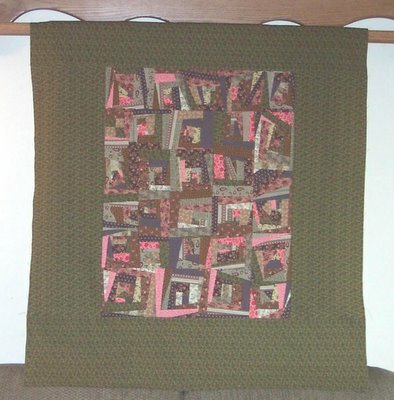 Within a year this tired mom had a quilt top! And then it sat. And sat. And sat some more. 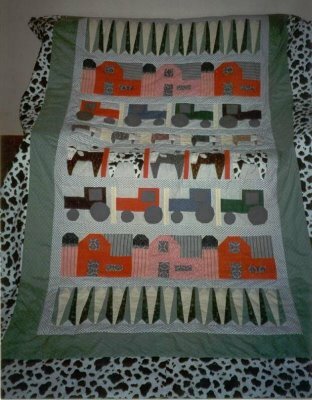 As the young children grew up into raging hormonal teenagers the mom was more and more stummped how to quilt this quilt. Something fancy didn't fit. But something plain was too boring. And of course it was special because her mother bought it for her to cheer her up. So what to do! Then - an amazing thing happened! 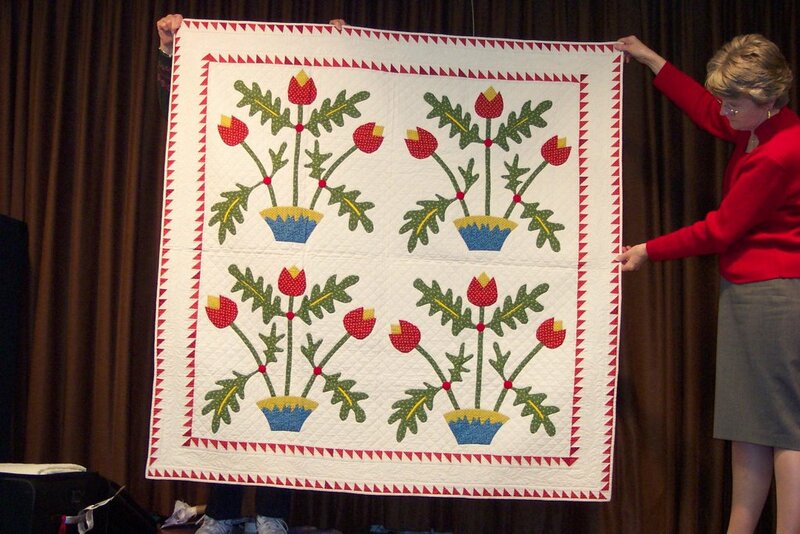 The fairy godmother of quilting came along! She had bought an amazing new tool for her machine! She played with it, and played some more! She shared her secret success with it on her blog site for all to see! And one day it hit the poor mother - thats it! Thats what the quilt top needs! 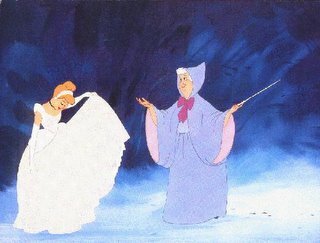 "I must send it to fairy godmother Bonnie right away!" 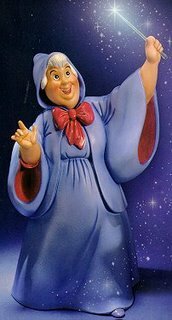 So the mother made arrangements with the wonderful magical fairy Bonnie and sent the top on its way. Before long she got an email. The top was done! And it looked perfect! 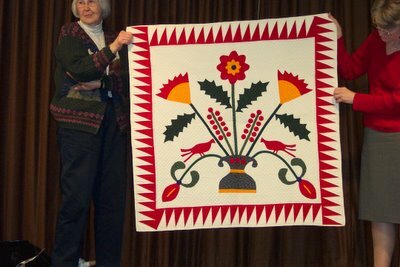 The design was just what the quilt needed! There was dancing and celebration in the mother's house (ok only the mother was dancing and celebrating - but hey, you got to get your kicks where you can)! 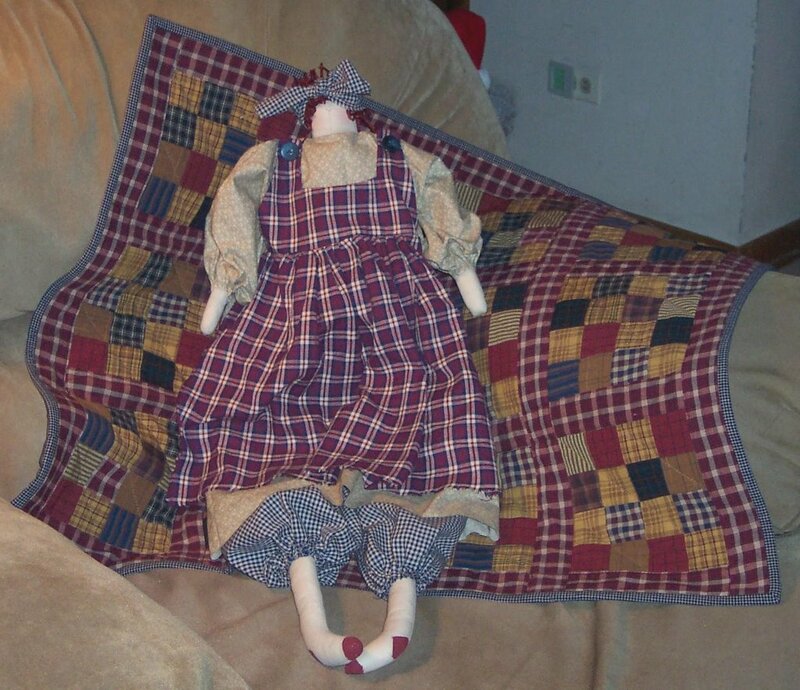 But the waiting for the beloved quilt kept her going. 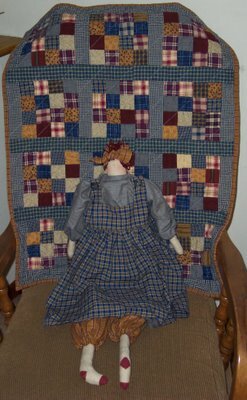 And finally, a small window of time opened up for her to share her story and some pictures of the quilt that fairy godmother Bonnie sent her to keep her spirits up. 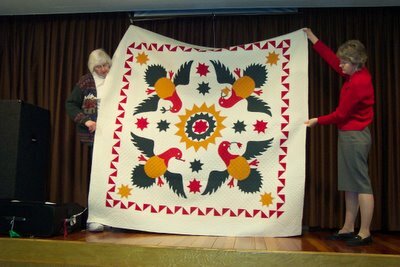 As we speak the quilt is winging its way to the gray busy land of IL! 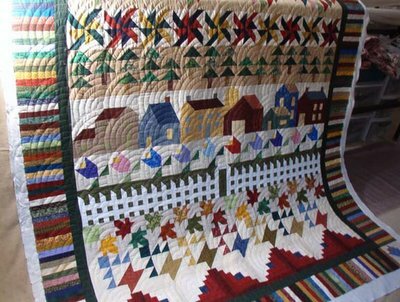 Soon there will time and sleep and comfy quilts again in the mothers house! Peace will return and life will resume as normal. She will live happily ever after!